I realized something recently that I hadn’t really thought about. Although this blog is mainly for young women, I haven’t really written on a topic a lot of young women like to read about–love and relationships. Here’s the thing–I’m not a relationship expert. I’ve been in a relationships before, and I have been in love before. From what I’ve noticed, it seems like the ideal Christian love story is the girl who waits for the perfect guy. Once she finds him a sign from heaven signals that he is the one. Then they fall in love, get married, and live happily ever after. The end. The only thing I can guarantee is that you will never find your true love unless you open yourself up to it. Although I do believe that the above love story can come true for some people, a lot of times finding a husband (or wife for any guys reading this), is a risk-taking adventure. Yes, there may be heartbreak or pain; there is no guarantee of an easy ride. The only thing I can guarantee is that you will never find your true love unless you open yourself up to it. I’m not saying that you should go out looking for random guys to date, but you should be praying about this and seeking God’s direction. Remember that the Holy Spirit can give you discernment on who you should date and if they are right for you. The beauty of failed relationships is that you learn a lot from them, and you get one step closer to the one God has for you. I’m a writer, and no matter what I write–whether it be my novel or a short story/poem–I almost always involve a romance. I love writing about love! It’s just who I am. And yes, I’ve had heartbreak, but it hasn’t discouraged me yet. The beauty of failed relationships is that you learn a lot from them, and you get one step closer to the one God has for you. Even though there can be pain, I still believe in love. I still believe in marriage and the holy covenant God intends for it to be. There is a balance in dating and learning to open your heart to love. You must learn to live in the moment and give yourself freely–while still allowing Jesus to guard your heart. I believe this is the greatest challenge for any Christian who is trying to date. The most important thing we can do right now is to remember that Jesus is, and always will be, the greatest love of our lives. We need to pursue Him like He pursues us. While we are still single we need to devote our lives completely to Him! Don’t be scared to fall in love. Don’t be scared of making a mistake or not finding “the one” as fast as you thought you would. God knows us and He can heal every heartbreak and meet every need if we allow Him to. In the end, we all fail at love. 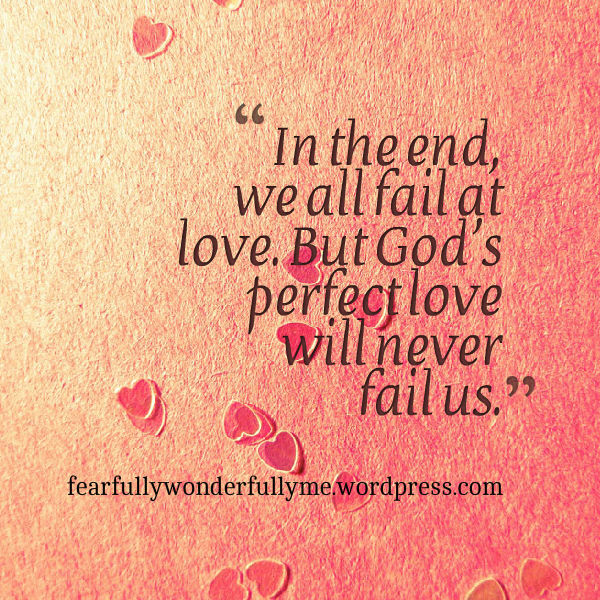 But God’s perfect love will never fail us. [Love] does not rejoice in iniquity, but rejoices in the truth; bears all things, believes all things, hopes all things, endures all things. Love never fails (1 Corinthians 13:6-8 NKJV). And if you have any other topics you would like to see me writing about, let me know! I like what you wrote here! I think that Matthew 6:33 applies well to this topic (although it’s a scripture that could really apply to any topic). Yes! I love how Song of Solomon not only depicts the love and passion of a Godly marriage, but also the love and passion that God has for us!